1.Preheat oven to 400°. Line 2 rimmed baking pans with parchment paper. 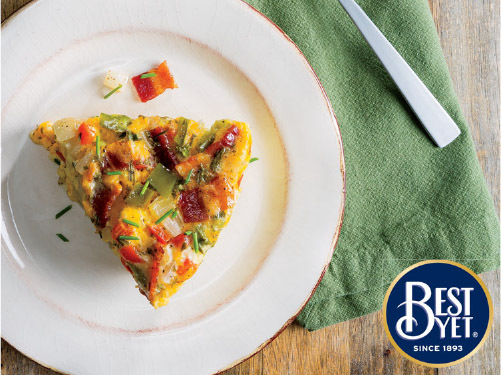 Arrange bacon in single layer on prepared pans. Bake bacon 13 minutes or until crisp; chop. 2.In large bowl, whisk eggs, milk, 1/2 teaspoon each salt and black pepper, and garlic powder. 3.Spray 6-quart slow cooker with cooking spray. Layer 2-1/4 cups potatoes into slow cooker and sprinkle with 1/3 each rosemary and remaining salt and black pepper; top with 2/3 cup chopped bacon, 1/3 cup onions and 2/3 cup cheese. Repeat layers twice ending with cheese. Evenly pour egg mixture into slow cooker. 4.Cover and cook on low 6 to 7 hours (or high 3 to 3-1/2 hours). Serve garnished with green onions.